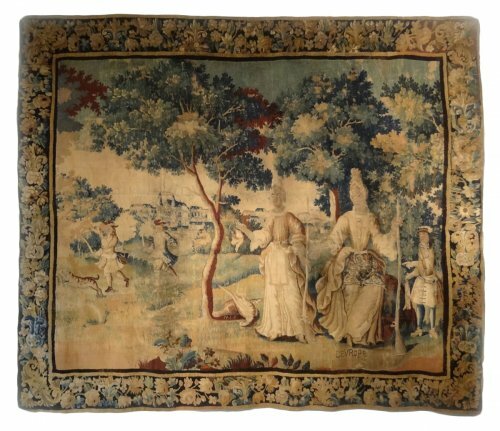 AnticStore > Catalogue > Tapestry & Carpet > Tapestry > Louis XIII > 17th century > LOUIS XIIIth embroidery representig "JAEL killing SISARA"
Exceptional framed embroidery, representing "Jael killing Sisara", General of Jasin, king of the Canaanites. Jael in a,ceremony dress embroidered with gold and silver threads, holds a hammer in her right hand. To her left, lying on the ground, a man who is obviously dead; in front of him, his helmet surmounted by feathers and his scimitar (oriental sword). Embroideries of gold and silver threads.The faces and hands of the characters are applied in painted silk. hammer and pierced his brain and so Sisara passed from sleep to death.